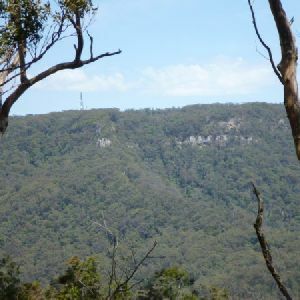 Hunter Lookout can be found on Bakers Road, along the Great North Walk. 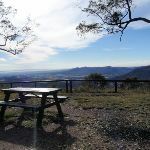 This fenced lookout has everything you will need snack-stop, including toilets, picnic tables, chairs and wood-fired barbecues. 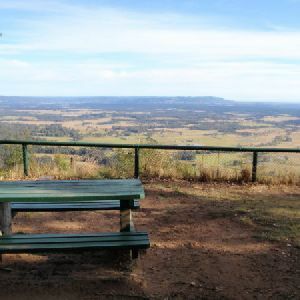 This lookout has fantastic views over much of the Hunter region. In 2010, a series of vandalism attacks occurred on the water tank, so water is no longer available at Hunter Lookout. 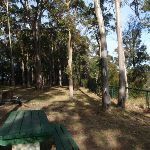 From the picnic area, this walk heads north, past the metal gate to the intersection of Bakers Road. 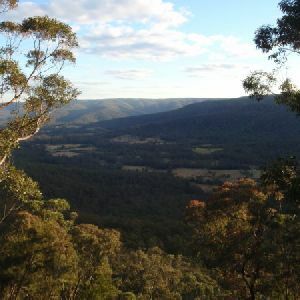 Veer left: From the Hunter Lookout picnic area (on Bakers Road), this walk follows Bakers Road north and gently downhill, while keeping Hunter Lookout on your left. The walk continues for about 400m until coming to a Y-intersection (Bakers Road loop). 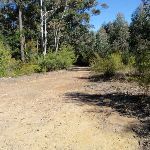 Continue straight: From the intersection (Bakers Road Loop), this walk follows the track gently uphill, while keeping the other end of Bakers Road Loop to your right, gently downhill. 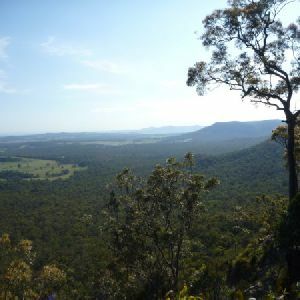 The walk follows the road for about 130m until coming to Macleans Lookout. 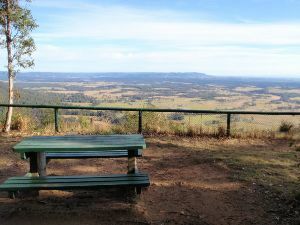 McLeans Lookout offers magnificent views of the valleys in Heaton State Forest. 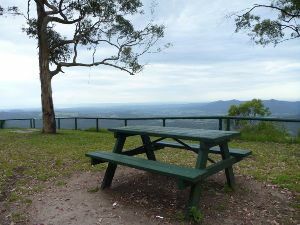 Located on Bakers Road, this fenced lookout also has picnic facilities including tables with seats and open grassy areas. 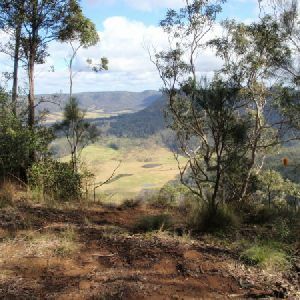 Veer right: From Mcleans Lookout, this walk follows Bakers Road gently downhill, while keeping Macleans Lookout behind you on your left. The walk continues for about 80m until coming to a three-way intersection with a wide track and GNW arrow marker (on the left). 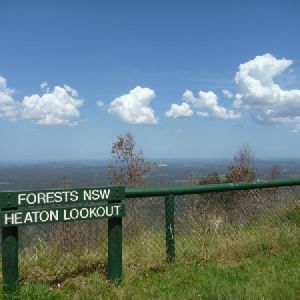 Continue straight: From the intersection, this walk follows the trail gently downhill, while keeping the ‘Heaton Lookout’ sign on your right. The walk continues (becoming moderately steep downhill) for about 280m until coming to a three-way intersection with a track on the left. Turn sharp right: From the intersection, this walk follows the track moderately steeply downhill, while keeping the GNW arrow marker on your left. The walk continues (descending moderately steeply into and out of a gully) for about 150m, until coming to a three-way intersection, Glen Road. Turn left: From the intersection, this walk follows the track gently downhill, while keeping the ‘Glenn Rd’ sign on your right. 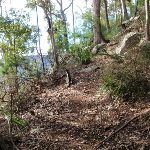 The walk continues through forest for about 120m, until coming to a three-way intersection with a track and GNW arrow marker (on the left). Turn left : From the intersection, this walk follows the GNW arrow marker moderately steeply down along the track. 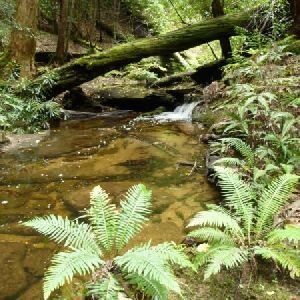 The walk continues for about 100m, to find a forested mossy creek where the track bend right and continues close to the creek for about 70m to then bend left and crossing the creek. 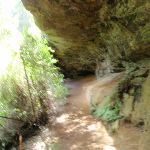 The walk now follows the track undulating gently for about 280m before finding a large rock overhang. The walk then continues moderately steeply uphill for about 200m until coming to a T-intersection with a wide trail and GNW arrow marker. 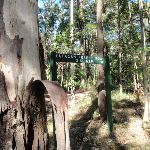 Turn right: From the intersection, this walk follows ‘Watagan Forest Road’ sign uphill along the trail for about 200m to a three-way intersection, with another ‘Watagan Forest Road’ sign (on your left). Continue straight: From the intersection, this walk follows the wide track gently downhill, while keeping the ‘Macleans Lookout 2km’ sign on your right. The walk continues for about 140m to a three-way intersection, with Fosters Road on your right and ‘Fosters Road’ sign on your left. Continue straight: From the intersection, this walk follows the GNW arrow post down along the wide old trail, passing the ‘Fosters Road’ sign on your left. The walk continues for about 100m, where the wide track then leads moderately steeply downhill for about 150m more. 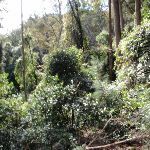 The walk then crosses a gully and heads up over another rise for about 70m to where the track narrows then bends left at a GNW arrow post. 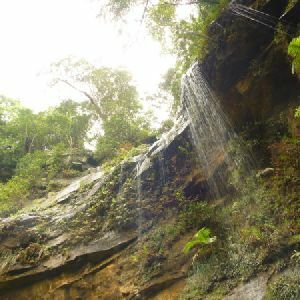 About 180m past the post, the walk crosses a gully then heads up the other side, past a termite mound to an unfenced cliff with distance valley views. 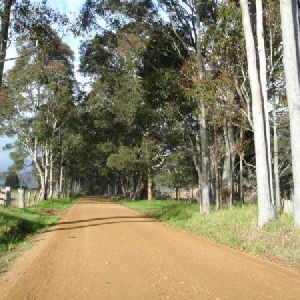 Here the track bends right and leads up a short distance to a dirt road. 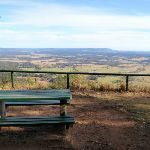 The walk turns left and follows the road down for just a few metres to the ‘Hammonds Road’ sign, where the ‘MacLean Lookout’ arrow points back along the road. 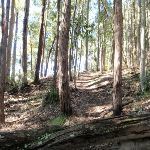 Turn right: From the intersection, the walk follows Hammonds Road along the management trail and up the steady hill, through thick forest to the intersection with Fosters Road. Veer left: From the intersection, this walk heads south-west down the long hill, following Hammonds Road along the edge of the plantation. Soon, the road heads up to the other side of the hill to the intersection with Hermits Road. 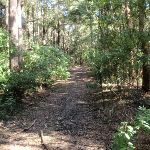 Continue straight: From the intersection, this walk heads west along Hammonds Road, following the edge of the plantation to the intersection with Rockey Creek Road. 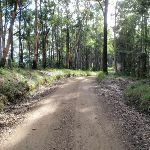 Turn right: From the intersection, this walk follows Rockey Creek Road north-west down the long hill to the intersection with Hermits Road. Continue straight: From the intersection, this walk heads down the hill along Rockey Creek Road, crossing a small stream on a rock platform and heading up the other side to the rest area on the north side of the road. 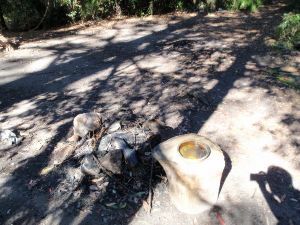 This campsite provides ample room for a few tents and a campfire, and there is a small creek a short distance away, which often provides opportunity to boil up some drinking water (may dry out at times). Continue straight: From the intersection, this walk heads up Rockey Creek Road, around the sharp left-hand bend and up the long and steady hill to the intersection with Bakers Road. 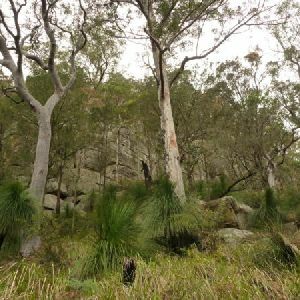 Turn right: From the intersection, this walk follows Bakers Road north and gently uphill, while keeping Rocky Creek Road (no signpost) on your right. The walk continues, undulating gently for about 400m until coming to a three-way intersection with Glen Road (on the right). Continue straight: From the intersection, this walk follows Bakers Road gently uphill, while keeping Glen Road on your right. 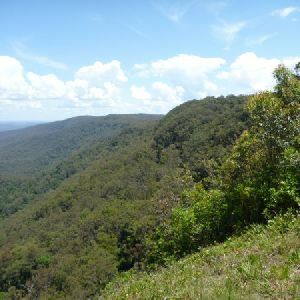 The walk continues, undulating gently for about 250m until coming to Hunter Lookout picnic area (on the left). 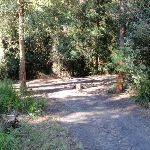 Veer left: From the intersection, this walk heads off the road and up the hill following the Hunter Lookout picnic area sign, past the wooden gate and the public toilet, to the picnic area area and the lookout. 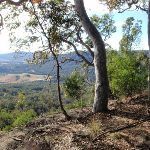 3.6km of this walk has short steep hills and another 1km has gentle hills with occasional steps. The remaining (1000m) is very steep. 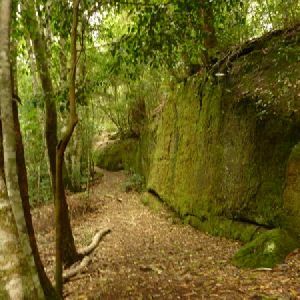 3.2km of this walk follows a clear and well formed track or trail and another 1.7km follows a formed track, with some branches and other obstacles. 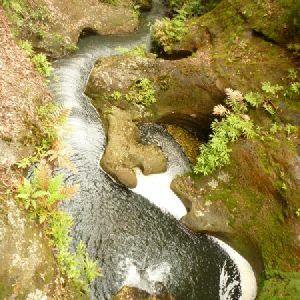 The remaining (720m) follows a rough track, where fallen trees and other obstacles are likely. Around 2.9km of this walk has minimal directional signs, whilst the remaining 2.8km has directional signs at most intersection. 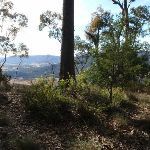 3.7km of this walk requires no previous bushwalking experience and another 1km requires some bushwalking experience. 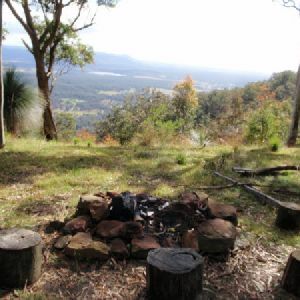 The remaining (900m) requires a leader a with moderate level of bushwalking experience. 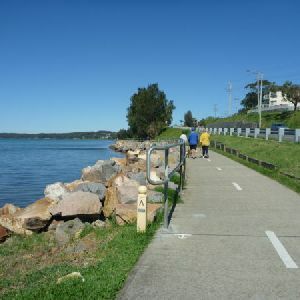 3.7km of this walk has limited facilities (such as not all cliffs fenced) and another 1.4km has limited facilities (such as cliffs not fenced, significant creeks not bridged). The remaining (530m) is close to useful facilities (such as fenced cliffs and seats). 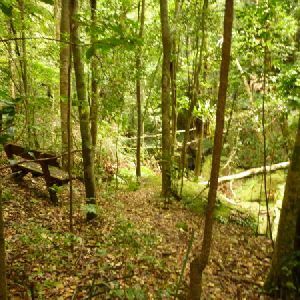 A list of walks that share part of the track with the Hunter Lookout and Great North Walk loop walk. 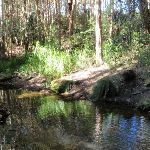 A list of walks that start near the Hunter Lookout and Great North Walk loop walk. 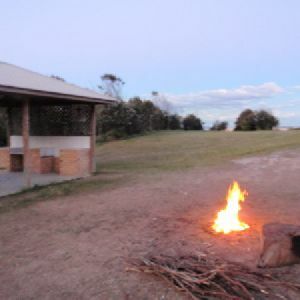 http://new.wildwalks.com/wildwalks_custom/includes/walk_fire_danger.php?walkid=nsw-heatonsf-hlagnwl Each park may have its own fire ban, this rating is only valid for today and is based on information from the RFS Please check the RFS Website for more information.